DEER LORD! 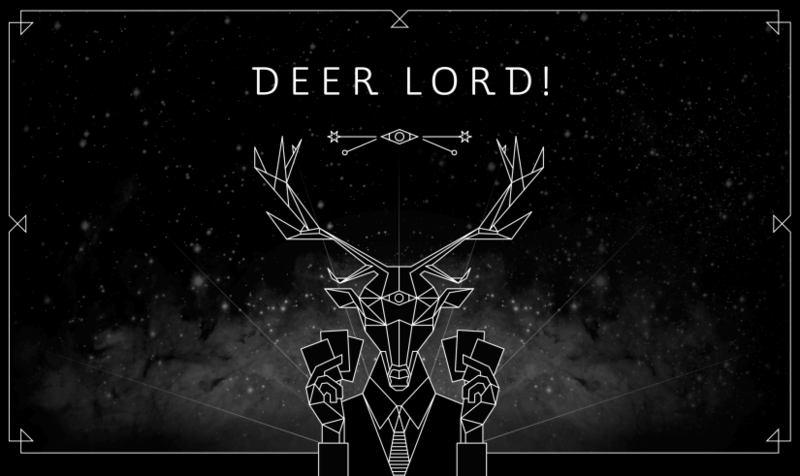 is an exciting party game where players duel, dupe and deceive each other until one claims the mantle of the DEER LORD! Try not to get caught as you give yourself a compliment, hit your head on the table or make up stories. Be sneaky, act crazy, manipulate the group and get creative if you want to win. New Game Alert! In The Sound of Sirens, you play as sirens from different musical genres, luring ships to their doom. The goal of the game is to be the first to crash ship onto the Merfolk Cliffs, at the end of the treacherous Dire Strait.  How do you play DEER LORD? Each player draws 5 cards (7 for a lengthier game). First player to have no more cards in their hand, wins the game. A game lasts approximately 30-45 minutes and is played by 4 to 8 people. 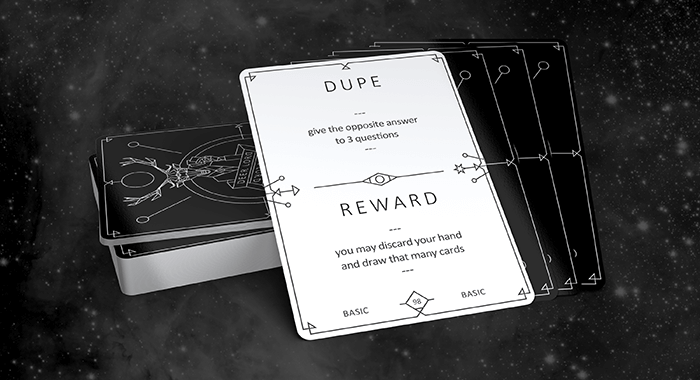 The other cards instruct you to ‘DUPE’ another player, during the other players’ turns. Afterwards, during your own turn, you may reveal whatever it was you ‘did’. The group then decides if you actually ‘did’ the ‘something’ (well enough). If so, you may place the card face-up on the table (again, will come in handy later). If not, discard that card and draw a new one. 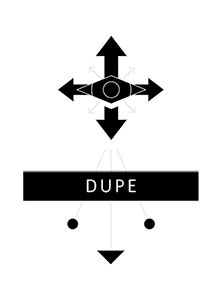 When anyone suspects another player is ‘duping’ another player, they yell ‘DEER LORD!’ and describe how they were ‘duping’. If the accused was indeed ‘duping’, they have to replace that card and the accuser gets to swap any card from their hand with the deck. If they were wrong however, the accuser has to draw a card OR remove a face-up card (told you these came in handy). 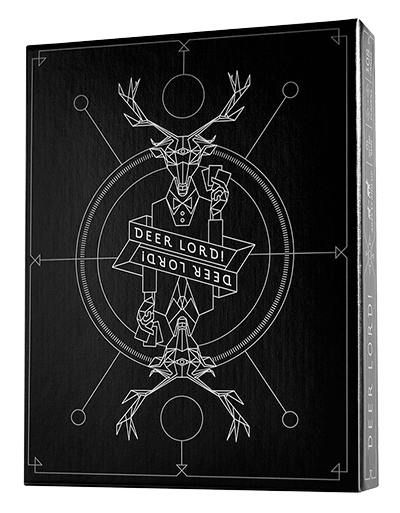 DEER LORD ‘Gold Edition’ is now available at TARGET retail stores across the USA. 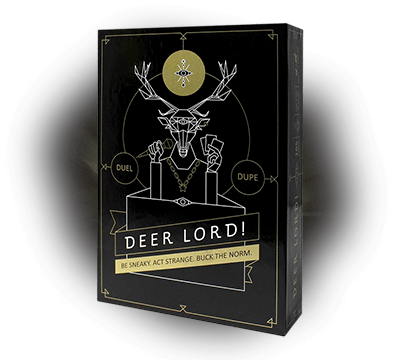 The gold edition includes the basic Deer Lord! card set (basic game) & the ‘Broadway’ and ‘Gangsta’ expansion sets. Did we mention it’s gold? GOLD! 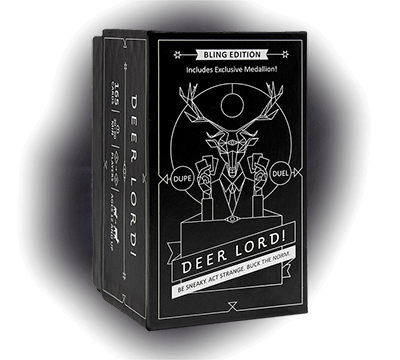 DEER LORD ‘Bling Edition’ is exclusive to Hobby Retailers and Amazon US (but it’s always better to support local businesses!). This set includes the core Deer Lord! card set (original basic game) as well as the ‘Geek’ and ‘Asylum’ expansion sets (‘Socially Awkward’ expansion). Additionally, it includes a collectible medallion not available through other channels. Elite swankiness! Still interested in the first old-timey edition? The guys and girls from ThinkGeek are keeping all of them in a time capsule… or they’re selling them online. 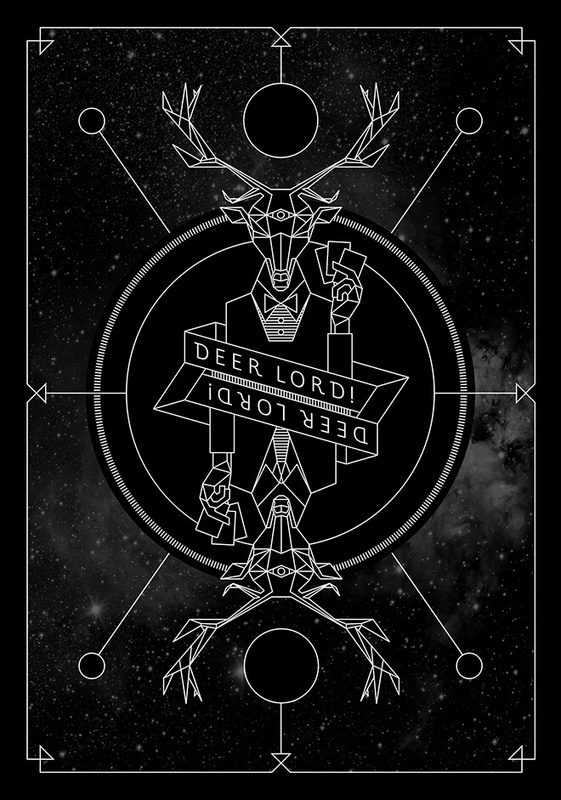 put your name on your own DEER LORD card and help us create a new expansion of DEER LORD!